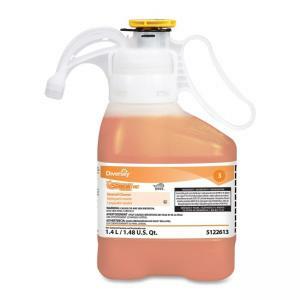 Neutral cleaner concentrate with a citrus scent cleans nearly all washable surfaces and does not need rinsing. Use as a daily floor cleaner and general cleaner in an autoscrubber, as spray-and-wipe application or in mop and bucket. Ideal for asphalt tile, concrete, dispenser, floors, marble, stone, terrazzo, tile, vinyl and walls. Low-foaming formula allows for less emptying of recovery tanks. Nonalkaline formulation dries film-free and does not dull floor finishes. Concentrated formulation delivers excellent performance for just pennies per diluted gallon.